NO political party should aim at forming government to unduly execute retribution and vengeance on its citizens but rather to cultivate a sense of unity and cohesion after taking over leadership, former president Rupiah Banda has advised. He said the culture of political vindictiveness, vengeance, retribution and pure political hatred should never be allowed to be nurtured because such vices had only achieved persecution against selected citizens in the country. Mr Banda said the continued threats by the UPND that President Edgar Lungu will have his immunity from prosecution removed if the opposition political party formed government after the August general elections had the potential to create tension during the election campaign period. He said Zambians and all political parties should be happy that the country was going to the elections to choose new leaders or renew the mandate of those governing and that the electioneering period should not be tensed by threats of arrests of a sitting President. Mr Banda said successive governments should endeavour to promote peace by resisting the temptation to embark on a retribution campaign in which former presidents and other leaders of a former ruling party became victims of persecution under the guise of the fight against corruption. He said some people had mastered the art of settling political scores against their perceived enemies using State institutions and apparatus. Mr Banda said when a Government embarks on pursuing and persecuting formers leaders, the resultant effect was that good governance was likely to suffer while efforts to continue developing the country often got undermined. Yesterday, UPND vice-president Geoffrey Bwalya Mwamba vowed that should his party form Government after the August general elections, the first thing they would embark on was to remove President Lungu’s immunity, investigate and send him to jail together with Daily Nation proprietor Richard Sakala whom he has been accusing of corruption. “Retribution, vengeance, vindictiveness and persecution is not the best way of governing the country. Threats that President Lungu will be arrested by the UPND should the opposition party form government is creating tension in the election period. The development of the country often suffers when a government embarks on retribution, vengeance and persecution of former leaders. I have been a victim myself and the PF at the time concentrated on pursuing me and stopped thinking about developing the country. We should never get back to such days and political parties should aspire to form government not to come and settle scores against their perceived enemies,” former president Banda said. He said it was not good for a country to have a President who was governing the country with constant fear that he would be arrested after leaving the presidency. Mr Banda explained that Zambia was the only country in Southern Africa where former presidents had lost immunity and have been prosecuted under the guise of fighting corruption, a culture he said was not good for national development. He said there was a lot of bitterness among political party leaders and that it was important to know that there should be progression each time there was a change of government and that political leaders should avoid preaching messages of hate and vindictiveness. 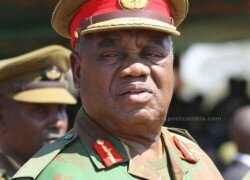 Bravo Mr. Rupiah Banda, that’s the spirit we want in Zambia. The spirit of peace, unity and love. God bless zambia and God bless everyone preaching peace.